Early morning on the Delta Clearwater River. As we boat upstream on the Delta Clearwater River, the fog is thick and the sound of the motor echoes back from the branches heavy with frost. As we weave our way up to the head of the river to begin our coho count we pass over riffles and pools where darting salmon move off their nests (redds) in numbers that I have not seen in 20 years. Today, the 21st of October, we will count nearly 103,000 salmon over 17 ½ miles of river. Dave Davenport, an Alaska Department of Fish & Game Fish and Wildlife Technician, is the boat operator. He skillfully negotiates the overhanging trees as the banks narrow. When we arrive at the “lake,” a wide section of the river, we are as far up as we can safely boat. The river continues upstream another two miles and then disappears into a wetland bog. 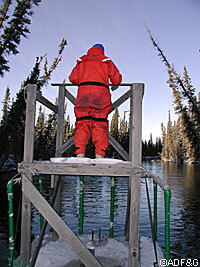 After waiting for the water to clear, I climb up the six-foot counting tower mounted on the bow of the boat. Motoring slowly back downstream we begin our count. It amazes me how different the view is from 12 feet above the gin-clear water. Scanning from bank to bank my thumb depresses the tally counter in my gloved hand once for each 25 salmon I see. Dave calls out the miles as we pass small, white markers on the bank. I record the count and reset the tally counter. In past years while drifting through sections of river where few fish normally spawn, I would get to lift my eyes to watch for mallards and swans. Today, however, is a different story; I am constantly counting fish, and five hours passes quickly. 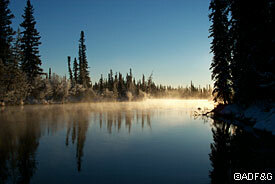 The Delta Clearwater River (DCR) is the largest of six spring-fed systems located near the community of Delta Junction, 100 miles south of Fairbanks along the Richardson Highway. Even when the air temperature reaches 50 below zero, the springs flow freely at almost the same volume as in summer months. Coho salmon begin arriving here in late September after traveling more than 1,050 miles from the mouth of the Yukon River. Like other salmon species, coho stop feeding when they enter freshwater. They use stored fat for energy to complete their long journey. Coho salmon are in the DCR late into December. The warmer inter-gravel temperatures make up for late spawning and lost incubation time. Young coho salmon rear in the river for up to three years before migrating to the ocean. The DCR is the largest known producer of coho salmon in the Yukon River drainage. Few of these unique springs suitable for coho salmon exist in the Yukon River drainage. There are several others near Nenana and in the Porcupine River drainage. It doesn’t seem to bother anglers that DCR coho are more red than silver. This year, during September and the first half of October, warmer than average temperatures brought anglers to the river in droves to take advantage of the last ice-free fishing. For the DCR angler, coho put up a good but brief fight. The males are establishing their territory around the females and are especially aggressive toward lures. Nearly all the sport fishing effort for coho salmon in the Tanana River drainage is on the DCR. This is likely due to good access. You don’t need a boat or even hip waders to catch fish. In 2002, DCR anglers caught an estimated 5,300 coho. Of those approximately 500 were harvested and the remainder released after caught. Since ADF&G began escapement counts on the DCR in 1972, the number of coho salmon has increased. One reason is the timing of the coho run. Coho salmon are the last species to enter the Yukon River each year, behind the fall chum salmon. When returns of fall chum salmon declined, managers shortened commercial fishing openers, allowing more later-returning coho to escape. Coho salmon were not the target of commercial fishing, but were caught incidentally. In recent years, most fall chum salmon commercial fisheries have been closed, and subsistence and personal use fisheries have been restricted or closed, allowing more fish to escape to spawning streams. Coho salmon harvest in the Yukon River fisheries peaked during 1987-1991 when catches averaged 115,000 coho for those years. In comparison from 1998-2002 only 19,400 fish were caught in all Yukon River subsistence and personal use fisheries and virtually none in the commercial fisheries. The coho are now returning to the DCR in high numbers that few, if any, have ever witnessed. The author counting coho salmon on the Delta Clearwater River. The DCR has many small feeder tributaries that are not boat accessible. In 1994 to 1998 I flew helicopter surveys of the DCR to estimate how many fish we could not count by boat. All the feeder streams had spawning coho in them. These five years of tributary counts averaged nearly 22 percent of the total run. Now, each year, I multiply this expansion factor by the count I get from the boat to get a total that more accurately reflects the run. In 2003, the total estimated coho count for the DCR was 130,600. How can this river barely 22 miles in length support such a large run? The answer is in the physical characteristics of a spring-fed river. The flow is consistent year round, with little change in temperature. The river has high quality gravel substrate, and the chemical nature of the ground water provides a thriving aquatic insect community capable of supporting millions of juvenile coho - and a large summer Arctic grayling and whitefish population as well. The carcasses of those tens of thousands of returning salmon provide a large biomass of nutrients to the river. The large run in 2003 may stretch the productive potential of this river; only time will tell. Over the years many people have been concerned about the quality of habitat in the DCR. It is evident that the entire DCR is highly productive, heavily utilized by fish, and deserves close monitoring to ensure that habitat degradation does not reduce the productivity of the river. Flooding from the Granite Mountains in 1989 carried sediments into the DCR. Sediments reduce insect habitat by filling up the spaces in the gravel where insects live. There is a major watershed project being developed to reduce future flood events. Agricultural development exists near the tributaries and agencies have limited the development near the river. Sediments are also introduced to the river by recreational boating when waves generated by large, heavy boats cut down steep-sided banks. Once sediments are introduced, a spring-fed river like the DCR, does not have the capacity to redistribute sediments as rapid-runoff rivers do when high flows occur. Habitat lost in unique streams such as the DCR takes longer to recover -or perhaps never will. The hope for this extraordinary run of fish is to see sustained future runs of this magnitude and increases to fisheries in the lower reaches of the Tanana and Yukon River. James “Fronty” Parker is the Upper Tanana Area Management Biologist for the Sport Fish Division with the Alaska Department of Fish and Game in Delta Junction, Alaska.